The New England Patriots owner and other defendants last week filed a motion seeking to block video evidence in the case involving a Florida massage parlor. New England Patriots owner Robert Kraft has pleaded not guilty and is seeking a jury trial on charges that he solicited prostitution in Florida earlier this year, according to court documents filed Tuesday. The documents maintain the NFL owner's plea of not guilty in late February to two counts of solicitation at the Orchids of Asia Day Spa in Jupiter, Florida. Kraft is not alleged to be involved in the human trafficking, and a spokesman for him said in a statement last month that they "categorically deny that Mr. Kraft engaged in any illegal activity." Last week, Kraft and 14 other defendants joined a motion seeking to block the release of any video evidence connected to the charges they solicited prostitution at the spa. Kraft allegedly visited the spa twice on the same weekend in January, and investigators said he was seen on surveillance video with a spa worker on both days. During a visit Jan. 20, Kraft was seen on surveillance video paying cash "at the front desk to an Asian female," according to investigators cited in one of the affidavits released last month. He was then escorted into a room where authorities said the sexual activity took place, the affidavit said. 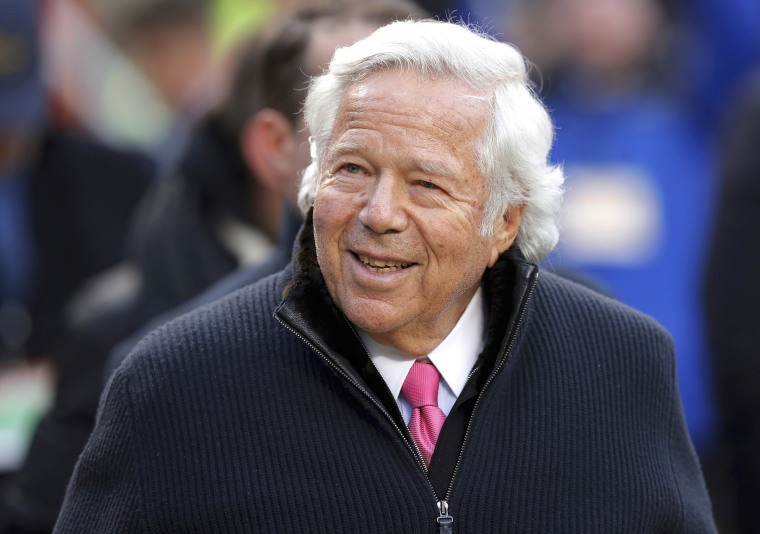 Florida prosecutors last week offered Kraft and around two dozen other men in the case a pretrial deal that would drop charges against them of soliciting prostitution at the massage parlor. NBC News obtained a copy of a letter from the prosecutors in Palm Beach County offering the deal to resolve the charges, which sources close to the investigation tell NBC News was given to each of the defendants charged with solicitation in the Orchids of Asia massage parlor investigation. The pretrial deal is part of a deferred prosecution program sometimes offered to first-time offenders who are willing to concede the state would have been able to prove their guilt. Under the proposed deal, Kraft and the others would have their charges dropped in exchange for their conceding that they would have been found guilty, completing 100 hours of community service per charge, taking an education course on prostitution, undergoing a screening for sexually transmitted diseases, and paying $5,000 per charge. Each defendant would also have to provide a statement detailing what happened in the massage parlor room. NBC News reached out to Kraft’s lawyers for comment Tuesday but did not immediately hear back. His lawyers have yet to comment publicly about the offered pretrial deal. At a press conference Tuesday evening, NFL Commissioner Roger Goodell took questions from reporters who pointed out that the league has previously suspended players who have not officially been charged with a crime. "The personal conduct policy applies to everyone," Goodell said. "But it'll be done after we get all the facts."